Carrick on Suir was the place to be on St Patrick’s Day if it’s cycling you were looking for. The sunny south east lived up to it’s name, the sun shone even if it was a little cold. 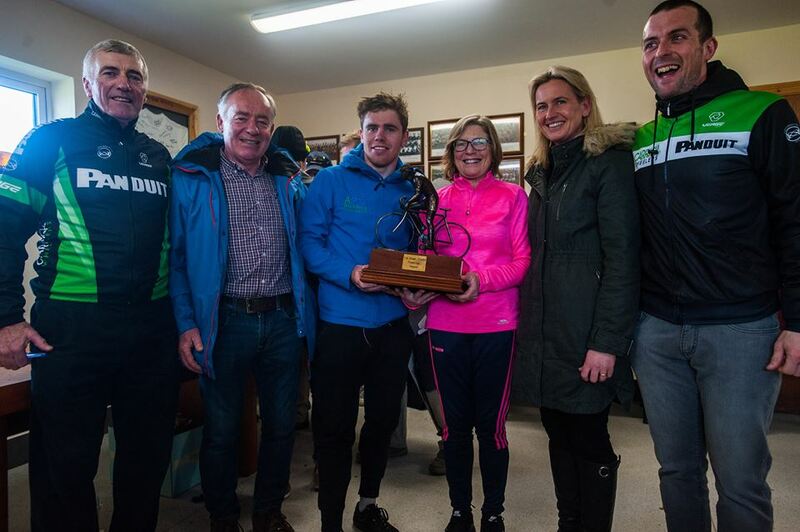 260 riders in total descended on Clonea-Power, 8km from Carrick on Suir to participate in one of three races hosted by Panduit Carrick Wheelers CC. The main event, the Bobby Power Memorial, named after a man who needs no introduction in the world of cycling, saw the A1 and A2 riders complete 6 laps of a 20km circuit. To say that it was a tough course would be an understatement and it concluded with an uphill finish after a sharp left turn, just off the main Dungarvan road. 100 riders took to the line but by the end of the first lap, a group of 12 riders had jumped clear of the rest of the bunch. The break split just after the halfway mark and four riders got around a minute of an advantage on what was left of the original break. Shortly thereafter, another rider bridged the gap to bring the front group to five. It was this five who stayed away to the end. Just before the last turn, JB Murphy of Murphy Surveys, Kilcullen attacked from the back and left the others in his wake to take a very impressive win and in turn lift the Bobby Power trophy. Second place went to Fintan Ryan of Kingspan Track Project and third went to Sean Moore of Bioracer DHL FR Services. In the A3 and Junior event, the Tommy Sheehan Memorial, 80 riders took to the start line. By the end of lap 2, three riders had a lead of nearly two minutes over the main bunch, however they were brought back by the end of lap 3. Four riders made a break for it during the penultimate lap and stayed away, coming to a sprint for the finish line. Neil Hodges of Killarney CC took the honours from Alex Sparrow, Bandon CC in 2nd place and Bernard Sweeney of Killorglin CC in 3rd. The final event, the Landy Cup saw 80 A4 riders take on four laps of the gruelling 20km course. On the second lap one lone rider, Sean Heaslip-Owens, stretched out a lead of over one minute on the bunch. By the final lap, three riders had over a two minute gap on the bunch and it remained this way to the line. The top spot was taken by George Duffy of Lucan CC with Sean Heaslip-Owens of DU CC in 2nd place and Patrick Joseph Gallagher of Blarney CC in 3rd. It was a fantastic day overall and ran like clockwork. This was due to the hard work put in by the club members in recent weeks and the trojan work done by all of our marshals, moto marshals, drivers and Cycling Ireland Commissaires, to whom we are very grateful. Thank you to our sponsors, without their assistance, none of this would be possible. We would also like to thank the late Bobby Power’s wife Mags and family, who served up the refreshments afterwards. Finally, thank you to the riders themselves, their dedication to this tough sport is to be commended. So that is it for another year, well done everyone and congratulations to our winners.